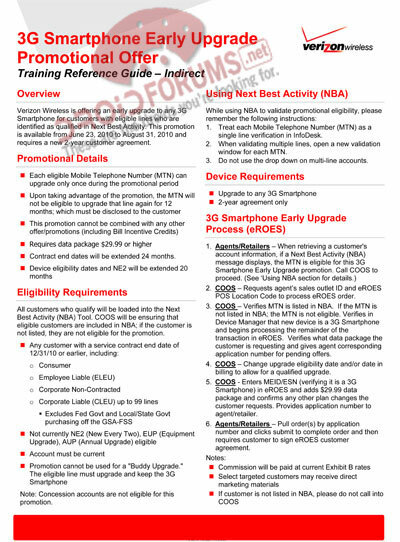 The details for an option to upgrade your smartphone early to the Droid X (or any smartphone) have been finalized. The deal was originally announced at the Droid X launch on Wednesday and will give any customer with a contract end date in 2010, the opportunity to upgrade between June 23rd and August 31st. Contract end dates will be extended 24 months. All customers who qualify will be loaded into the Next Best Activity (NBA) Tool. COOS will be ensuring that eligible customers are included in NBA; if the customer is not listed, they are not eligible for the promotion. Now before you all run out to Best Buy today and pre-order the Droid X, remember that the Droid 2 should be launching in August which would also be covered by this deal.